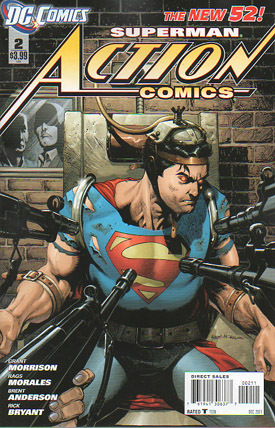 Set five years in the past, Superman lands on a rooftop and confronts a crooked businessman named Mr. Glenmorgan, and has him lifted above his head as he stands on the balcony railing when the police arrive. 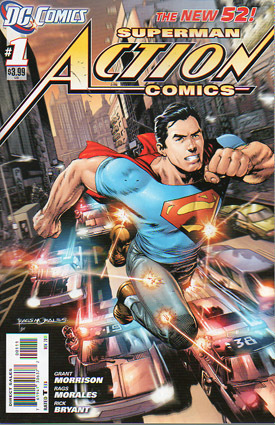 All Superman wants is for Glenmorgan to admit to his crimes, but he only confesses once Superman jumps off the building and lands them on the street below. The police chase after Superman as General Sam Lane and Lex Luthor look on from inside a secret facility. Lex sets about knocking down a condemned building that still has squatters inside. Superman comes to their rescue as the military arrive to arrest Superman. The people Superman rescued defend him, giving him the opportunity to get away. Back at his apartment Superman changes clothes and greets his landlady as Clark Kent. He pays her his rent before calling Jimmy Olsen to warn him and Lois not to get on any train because of what happened with Glenmorgan. Lois is hot on the trail of one of Glenmorgan's men, and won't listen to Clark's warning (especially since he works for the Daily Star). Glenmorgan's man has rigged a bomb on the train. 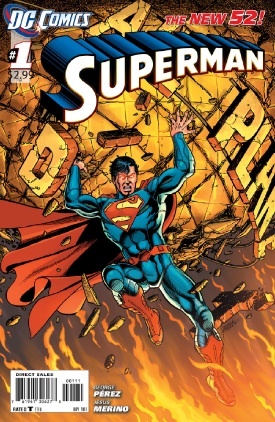 Superman stops the train with a lot of effort, saving everyone... but he's unconcious, trapped between the front of the train and the Daily Planet building. Superman awakens to find himself strapped into an electric chair. Lex Luthor questions him, electrocuting him much to Doctor Iron's anger. General Lane looks on as soldiers test the indestructibility of Superman's cape. Lois arrives at the military base to question her father. Lex thinks Superman is a shape-shifting alien from a race set to invade Earth. Superman laughs before angrily escaping his confines and breaking free of the room he was being held in. He grabs Lex Luthor and heads out to retrieve his cape. In another room he finds a space ship which reacts to his presence and speaks in Kryptonian, calling him Kal-El. On his way out he spots Lois. 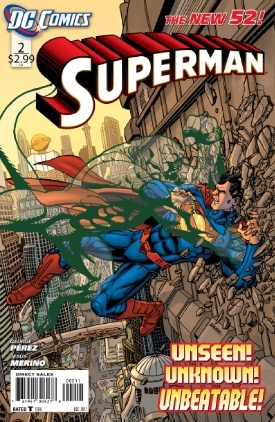 John Corben steps into a room, prepared to put on a special battle suit in which he will take on Superman. From his limousine Lex Luthor communicates with an alien space ship in orbit above Earth. In current time, the people of Metropolis watch on as the old Daily Planet building is demolished and the new Daily Planet is launched, with Lois as head of the new Planet Global Network TV and Online division. Clark is not at the launch, having been disappointed at all the changes, and having turned down a job as anchorman on the TV news. As Superman he spots criminals hijack a Metroil truck, while at a nearby Metropolis Astrodome a strange fire has a security guard on edge. The truck explodes as Superman flies it above Metropolis, and the people of Metropolis think the Man of Steel is responsible for its destruction. But Lois and her crew are able to send live pictures to people's TVs showing them Superman under attack by the strange fire that eminated from the Astrodome. In a heated battle, Superman uses the old Daily Planet globe to knock out the fire creature responsible for the attack and take it into space where it vanishes due to lack of oxygen to burn. Clark's story in the Daily Planet pleases Perry White, while Clark goes to Lois' apartment to apologize for his reaction to her accepting her new job... but he finds she's not alone. She has male company in the form of her new boyfriend Jonathan Carroll. Superman checks out star charts with Sam Lane, trying to determine where the fire creature came from. General Lane asks Superman about his relationship with Lois, and Superman thinks back on Lois & Clark's friendship. In Metropolis police are looking for a squatter in the subway tunnels, the man escapes them... and his eyes glow. Flying over Metropolis Superman is attacked by a creature he can't see. Normal humans and cameras can see the creature, so Superman uses the billboard news screens and people's personal computers and phones to keep tabs on where the creature is so he can defeat it. Before disappearing the creature speaks in the same alien language as the fire creature, uttering the word "Krypton". At his Fortress of Solitude Superman is unable to solve the mystery. At the Swan Klein Hospital the burnt security guard is visited by the squatter from the tunnels... and their eyes both glow.